I knew Richard Dix was the Whistler and that William Castle directed some of the better series entries, but my acquaintance was limited to stills and a misunderstanding that this series seldom rose above "B" levels and was thus safely ignored by latter generations. Wrong was I on several counts. First off, Dix was not himself the Whistler. That character would remain unseen, except in shadow, and would at best serve as Greek chorus for principals changing with each film. Richard Dix was the only constant, but he never repeated roles within this series. Each installment would be a tour de force and provide more variation for the actor than other leading men, even in "A" parts, might hope for in whole of careers. Over seven thrillers in which he starred, Dix was sympathetic here, dangerously psychotic there. Wealthy in one, down and out in the next. Had these pictures attracted critical notice, Dix might have been rescued from low-budgeters and back in stardom he had known during the twenties and early thirties. Overripe in salad days, RD pushed pedals to the floor in big ones like Cimarron, and for my money, he’s dynamic there as empire builder, but once talkie empires were established, Dix’s billing fell below the title except in low-budget he-man actioners evocative of those that gave him a start. Nearing his fifties by the forties, both Dix and the Whistlers aged like fine wine as his tortured alter egos wandered dark alleys and were buffeted by fate. Scripts were borrowed, and padded, after radio’s Whistler team had their go. Sometimes uncertain pacing betrays those origins. Little will happen the first forty minutes, then there’s a rush to finish with plot contrivances unpredictable if unlikely. Crazy illogic plays as though it were everyday normalcy and you keep waiting for one of those dream endings to restore a semblance of reality. Customary "B" economies are observed, as these were pictures not likely to break out beyond predictable returns. For random example, Mark Of The Whistler earned $270,000 in domestic rentals, Power Of The Whistler $226,000. Like most series, revenue diminished as more came off the line. By Return Of The Whistler (the final entry), domestic rentals were down to $166,000. 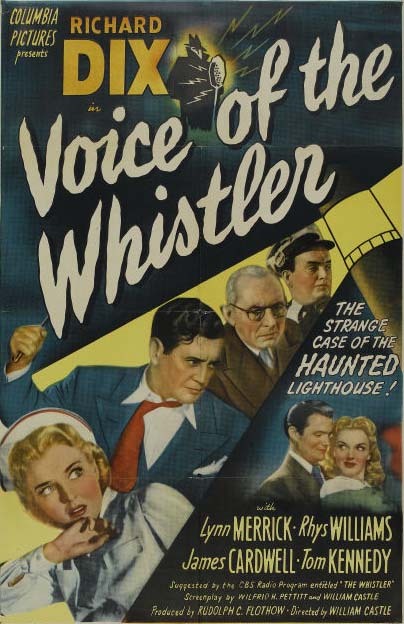 Young and eager director William Castle used Whistlers to show off for Columbia chief Harry Cohn, and a lot of his showman’s tricks were previewed for viewers who would encounter Castle a decade later in tricky horror pictures. Always in readiness to lift ideas from their betters, the Whistlers drew upon Citizen Kane for one (Dix’s tycoon life told in opening newsreel flashback) and The Maltese Falcon on another (Dix as morally bankrupt private eye pursues priceless Jenny Lind wax cylinders). All of which is to say neat ideas are in abundance here, and were it not for callow youngsters auditioning before Columbia cameras (Dix really carries a lot of dead weight among so-called supporting casts), these thrillers might enjoy enhanced reputations today. 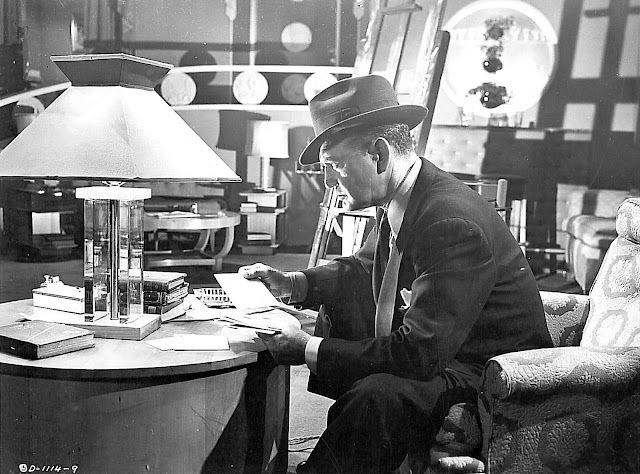 The Whistlers revolved upon the same studio wheel that drove The Crime Doctor, Boston Blackie, The Lone Wolf, and Ellery Queen. Nobody had as many detectives and mysteries running as Columbia. Most have hung shingles at TCM of late after years of comparative invisibility. All are worth revisiting. Ask anyone who was there in 1967, and they’ll tell you the money shot in Berserk is definitely Micheal Gough getting an oversized spike driven through his forehead from behind (to paraphrase Batiatus to Crassus, Brilliant thrust, difficult angle). It’s a breathtaking tableau that has stayed with me since, and I was happy to see it left intact for TCM’s recent showing. 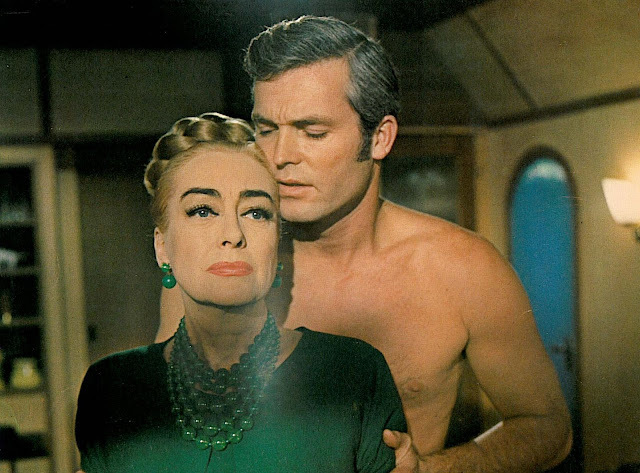 Do note Gough’s anguished countenance lined up alongside Joan Crawford in the one-sheet here. 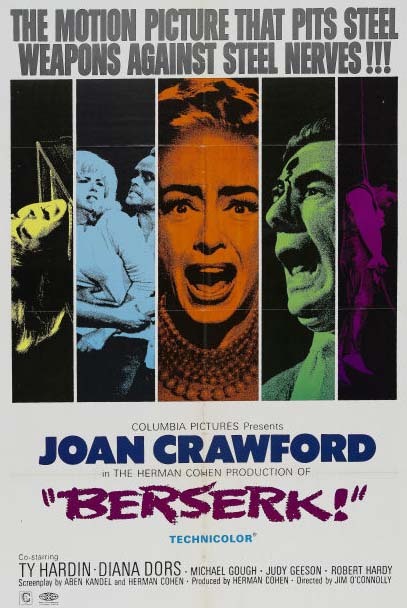 Berserk was among trashy shock shows aging actresses were loathe to accept in the post-Baby Jane sixties. Outside television and summer stock, however, these were the only games left for even biggest names of yore. Crawford is again hard-as-nails boss lady (and potential, if not actual, murderess) as befitting her public and private image since Mildred Pierce and the end of World War Two. The fact she was still able to play it with name above the title after twenty years is testament to her amazing longevity. Berserk is notable for putting Crawford front and center again after less rewarding featured and "guest star" appearances in support of others (The Best Of Everything, The Caretakers). 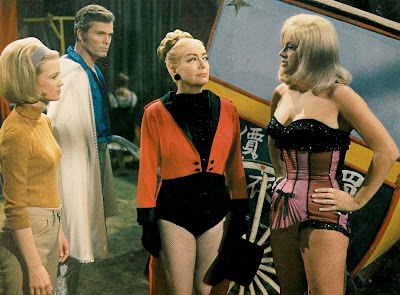 At sixty-two, she’s brandishing trim legs and a wig pulled back like Barrymore’s Hyde hair, creeping us out with dialogue implying (mercifully offscreen) bedroom frolics with Michael Gough and Ty Hardin. Mayhem against circus backgrounds was so common as to presumably discourage post-war youngsters from wanting to leave home and join the big top. Tent shows in thrillers of limited budget were always of the struggling and fleabag variety. Serial murders seemed all the greater a hardship as so few performers could be spared without endangering the whole enterprise. Suspects are sufficiently limited in number as to necessitate dragging in by the heels a "surprise" killer who doesn’t even appear until the second half of the picture. Authentic circus acts play in their entirety, so there is uneasy communion between trained dogs and trapeze performers either hanged or impaled on a bed of nails, with Crawford functioning as a distaff Don Ameche presiding over a big-screen International Showtime. Producer Herman Cohen would regale interviewers with Berserk anecdotes, most arising from efforts to placate his imperious star. He’s shown twice among spectators in the bleachers. There would be fewer of these for Cohen’s kind of exploitation shocker as a soon-to-be introduced ratings system enabled gorier chills and rendered tame Berserk and much of what had horrified us in the sixties. Michael Gough is happily unaffected by unexpected stakes through the head and celebrated his 93rd birthday on Friday November 23rd. That's a great review you wrote for "Roar Of The Dragon", Michael. Thanks for providing the link to it. m blackmoor, I'm happy to hear of Michael Gough's recent birthday. He's one of the greats. Wish someone would release "Black Zoo". Being an Allied Artists picture, I assume Warners owns the negative. Enjoyed the Whistler info very much, John--I wholeheartedly agree that they are entertaining little programmers despite their B-origins. I might have been 12 years old when I saw, for the first time "Bersek", on television, in black and white (my parents didn't have a color TV set until 1985) in a late night airing. No masterpiece, but it was an OK film specially when you are ignorant on who Joan Crawford was. When the WB channel in Latin America (a dead network here, but well alive outside the United States) played, I immediately recognized it.